Every venue has its own character and so does coffee. That’s why Hesselink Koffie, in addition to espresso coffee, sustainable coffee and filter coffee, also offers specialty roasts for hospitality businesses. By providing you with your own roast Hesselink Koffie wants to offer you a coffee blend that matches your venue down to the detail. The specialities are part of our product range. We have several varieties of specialty blends for hospitality businesses. For example single origins; coffee made of coffee beans from a specific country and region. Hesselink has selected the finest coffees which are used in several melanges. It goes without saying that all of our coffees are easy roasted and soft vacuum packed in aroma. If you would like to experience firsthand what difference Hesselink Koffie could make to your guests, why don’t you try it for yourself first? We offer business owners the possibility to order a free kilo of Hesselink Koffie. We believe there is no better way to judge the unique experience we can offer your guests other than to try it yourself. 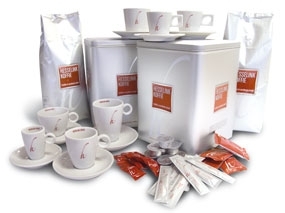 Are you a professional who would like to order a free kilo of Hesselink Koffie?